Magic-users get 2 + level six-sided spell dice. Any number of spell dice may be used to cast a spell. Casting a spell successfully requires rolling 7 + spell level or higher. Any die that comes up 1 or 2 is removed from the pool. All spell dice are recovered following a restful night of sleep. This method is separate from the approach used for deciding which spells are available for casting and could be used with any spell preparation scheme, including the traditional complicated collection of level-based slots, or something simpler. For example, a third level magic-user has 2 + 3 = 5 total spell dice. This magic user attempts to cast a second level spell, which has target number 7 + 2 = 9. Three spell dice are committed and rolled, yielding 2, 4, and 5, with a total result of 2 + 4 + 5 = 11, which is enough to cast the spell. One of the dice came up 2, however, and so is removed from the pool, leaving the magic-user with only four dice for future spells. This would work with level-agnostic spells. Just treat every spell as level 1 (meaning the target number is a flat 8). 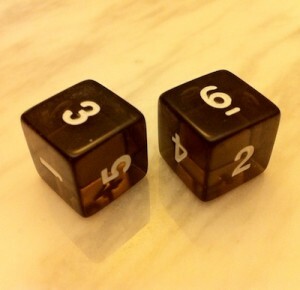 The scarcity of magic can easily be adjusted by changing the number range which removes dice from the pool (specified above as die results of 1 or 2). Any number of other bonuses could be factored into the spell roll, but any math beyond the calculation of the initial target number (7 + spell level) will make the procedure for casting spells feel more cumbersome in terms of game mechanics. The above rules are the minimum required to make the basic system work, but there are several other details which would add to the system. If the spell fails with a result that includes snake eyes (two or more 1s), the outcome is a magical catastrophe (with effect appropriate to the spell in question). If the spell succeeds with a result that includes boxcars (two or more 6s), the spell is cast with greater effect than normal (increased range, more enemies affected, extra damage, or something similar). When spell dice resources are depleted, magic-users can also draw on their own life essence to fuel spells. Life energy dice may be used, but they deal damage to the magic-user whether or not the spell is successful. The number of life energy dice usable at one time may not exceed the magic-user level. Care should be taken with this option based on the availability of healing, as any effect that can restore HP can also be used to power spells, and healers may become spell batteries. Life energy dice are always expended when used. It would be reasonable to apply armor penalties to any spell roll total if armor is not restricted by class. Similarly with encumbrance penalties if encumbrance is tracked. 1-5: spell goes off at the end of the round, lose the spell. 6-8: spell goes off at the end of the round. 9-12: spell goes off instantly. It is also an example of concentric game design (the first five points are necessary while everything else is supplementary). ★ This is a binomial distribution. Probabilities can be found in the rightmost column of this spreadsheet. Thanks to Joshua M. for assistance. Corrected paragraph comparing this to Courtney’s system, as I misread how he applied modifiers, and added info about how he changed the results table after seeing it in play. Based on discussion here and here, I am concerned that an unlucky first-level magic-user might not be able to get off any spells successfully before exhausting all the dice (this would happen about 15% of the time, assuming that life energy is not used, according to Ian B.’s numbers, if any die that comes up 1 or 2 is always removed from the pool). That’s no good. This could be somewhat mitigated by starting off beginning magic-users with more than 2d6 base spell dice. However, I think a better solution would be to only exhaust dice on either successfully casting a spell or failing with a catastrophe. That way, any given spell casting would not be guaranteed, but magic-users would not expend dice without also producing some sort of effect (either good or bad). This entry was posted in Rules and tagged magic-user on November 1, 2013 by Necropraxis. I love this! Clean, useful and also flexible. A quite elegant system. Even if only as an exercise in game design, this is superb and should be used. Re: stealing life force: there should be some added danger to engaging in such black magic, for reasons of both atmosphere and game design. Perhaps make it require a ritual that takes an exploration turn to accomplish, and create a table of additional “blood magic” catastrophes that would occur on rolls of snake eyes when using stolen life force. Re: counter magic: I think making countering spells easy is beneficial, because it encourages the classic back and forth spell duel. As long as there is a resource cost to the attempt (as is the case where the player loses dice on rolls of 1 and 2), opposed checks would work well. Re: more on stealing life force. Perhaps on life stealing snake eyes, a hostile demon of HD equal to the number of dice used for the spell roll is summoned. That is a simple table-free method that is easy to remember, and fits pretty well. I like this system very much. The highest target number in standard D&D would be 16 (7+9), and a 1st level wizard starts with 3d6 spell dice. That means that assuming spell access is not limited by level, a 1st level wizard could attempt to cast a 9th level spell. Of course, if that’s a possibility there should probably be equitable costs too. Remember that this is a spell resolution system and doesn’t necessarily speak to which spells can be prepared. For example, if using the standard D&D spell slot system, magic-users still wouldn’t be able to prepare a 9th level spell until much higher level. Even if you did allow low level magic-users to cast high level spells, 16 or higher on 3d6 is 4.63%*, and the more dice used, the greater chance that a failure will also be a catastrophe (though the chance of failure also decreases as the expected value rises). My own inclination though would be to opt for a simpler preparation scheme (like the one described in my recent sorcerer class** post), and control access to high level magic through the distribution of spells in the campaign world. In traditional D&D, a first level fighter could make use of a +5 sword too… if they could find one. This seems to work out okay in practice. This is very elegant. 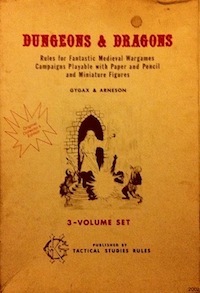 Possibly more so than the 2d6+Mage Level/2-Spell Level-Armour system. I very much like the idea of low level mages attempting to cast higher level spells. As long as their chance of success is low, it is fine in my game. It normally leads to disastrous results and can drive story – as an example one of my players had contracted a stone leg, speed 10′ and wished the mage to cast stone to flesh – this was a level 5 spell and he was basically casting it at a -3. The mage miscast, the result was a spell like explosion on a random target nearby which of course was the poor unfortunate with the stone leg who promptly exploded all over the onlookers in the marketplace, who promptly applauded at the spectacle thinking it was a show. The players still talk about this event whenever they visit the town’s marketplace. On drawing on life force I would definitely worry about healer types becoming spell batteries. In one sense it is a clever use of the system but at higher levels could become abusive. Using the 2d6 system above my mages who have a healing spell could cast it many times over, until they lost the spell, as their spell is not exhausted except on poor rolls. I probably wouldn’t bother with the encumbrance part, but armour definitely should be a penalty of some kind. My apologies if this was covered / implied somewhere in the post and I missed it, but what happens if all but one of your dice are removed from the pool? The minimum target number required is 8, so if you roll on your turn and get a 5 can you “bank” it and roll again next turn (hoping for a 3+)? Is that the purpose behind the Life Energy option? Yes, that’s right; one die alone cannot successfully cast even the weakest of spells. As you note, at that point, you need to tap HP for spell casting. I hadn’t considered banking the roll of a single die. I think that would also be viable, but it would probably need to be a special rule only allowed for when exactly one die remains. Otherwise, any failure could be “continued” on the next round (assuming there was not a catastrophe). Needing such a special case makes the system a bit harder to remember or explain, so I would probably prefer the first option (needing to tap HP). One other issue that this system does raise is enemy target saves versus magic. Where you have a system like BECMI that nearly always assumes that the spell is cast without failure enemy saves make sense. Where you have this kind of system where the act of casting is less than 100%, often much lower, having enemies then save against the spell seems to stack the odds against the mage? I removed a lot of saves versus spell effects when I implemented the 2d6 spell system and would probably do so under this more elegant system. I see what you mean. This system doesn’t take enemy strength into account unless you add saves, which is clunky. Maybe spells that effect enemies could have a target number based on the enemy, rather than the spell level. The target number could be something like 7+Enemy Level or Hit Dice. Could anyone figure out how that compares to the save effects of traditional wizard spells? It seems like a good idea, but I have no clue about the maths. That’s a good point regarding the saves. In the 2d6 cleric petition system* I used, effects like turn undead are opposed by enemy HD rather than spell level, which sort of serves the same purpose. In this case, if using the traditional spell list, removing all-or-nothing saves might be appropriate, but I would probably leave in the half-damage saves (like for fireball). I need to consider this issue more. Personally, I prefer for spells to have some effect even on a successful save, given that the magic-user is expending a relatively precious resource, even in the traditional slot guaranteed success method. This also prompts me to go back through the Wonder & Wickedness (level agnostic) spells and revisit where I am using saving throws. First, You’re welcome! I am finding this system awesome in play. I’m glad you were able to remix it! Second, fivefold lookup is a little extreme! That doesn’t really describe what I wrote. I’m using the traditional spell prep system. 5 or less? Cast but lose the spell. Otherwise the spell goes off immediately. There are rules about doubles, but really you are just checking for those two breakpoints. I’m often finding things that look complicated on paper are actually very straightforward in play. In Pahvelorn, some players have been using the 2d6 magic** I posted earlier this year, and it has been working out well, though we still forget what the result ranges are regularly (and don’t, apparently, feel like noting the details down on reference sheets or character sheets). So this adjustment is based on six months of actual weekly play, not just examination of rules on paper. Which is not to say that slightly heavier systems don’t have their place, but the exercise here is simplification while maintaining the properties that are most important to me. While I really like your original dice pool approach (obviously, given that this is that but just slightly tweaked), it seems like you are tracking resources in two places: both the dice pool and the spells available (since you can lose spells). Part of the motivation here was to track the resource aspect of magic in only one place (which allowed me to do away with all modifiers and table lookups, meaning the only math you need to do in the common case is adding the dice rolled and calculating the target number, and the target numbers are likely to be close to constant in practice). Interesting; thanks for the link. Reproducing your comment from ODD74 below just so that I have all the data in one place (and in my blog backups). I created a small program to simulate such casters; below, I present you my findings, gathered from 100,000 simulations for each row. I assumed casters devote a number of their spell dice to casting a spell of a given level (“X spell dice used”); they tried to cast it until it became impossible for them to do so (i.e. they ran out of dice). The first number after “=” means the average number of successful repeated spellcasting attempts, whereas the number in parentheses, really just for fun, shows you the greatest number my fictitious spellcasters could cast a given spell repeatedly. Note: Even if the number of available spell dice decreased below the initially committed amount, they continued as long as there was still chance succeeding. I love this system, thank you for sharing! I might tweak the math a little, but the core mechanic is wonderful. It gives the caster a simple but effective way to decide the amount of effort they want to spend on a single casting. It also lies in a fine line between a completely deterministic mechanic (such as spell points) and a bit too random one (single d20 check with fail or success outcome), since the caster can actually decide to commit more power in order to decrease the chances of failure. Thanks! Let me know how it goes if you use it in play.